Ps: the collaboration won't come back, last 2 weeks of the patch will be like Crash Fever. Not bad had killua from monthly purchase. Edit:Can someone tell me how to make a spoiler here so the image isn't that big? 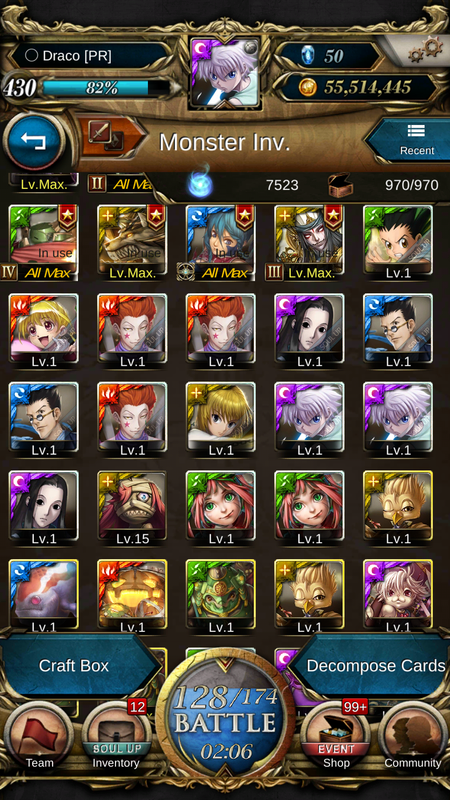 Made 5 draws, 3x Illumis and 2 Leorios. Damn , oh well. Rate up is real but it didn't get me Gon huhu. A rare for every 3 draws almost. Very lucky with this Collab, got 3 Gons 3 Killuas and 3 Kurapikas before even getting 1 Leorio lol. Got 3 Gons, ANOTHER Kuprika, and finally got Killua on my last pull. Set is complete and now I wait next patch. (06-08-2018, 02:20 AM)draconian Wrote: Can someone tell me how to make a spoiler here so the image isn't that big? You can also resize images by changing [img] into [img=WIDTHxHEIGHT]; they'll look stretched if the dimensions aren't in a similar ratio. Thanks for the info, I ended resizing cuz it was huge before, set it to 250x500 and at least it looks normal. Used rock paper scissors draw on leorio... The one time I'm glad to have commons as options. Lucky with this colabs draw too. Almost right amount of dupes too.